Feature 1 is claimed to improve S/N when irradiated by gamma radiation, the effect would be of most benefit in the event of a nearby nuclear bomb. Given that most ham stations are not EMP hardened, this is unlikely to be of material benefit to those ham stations. Thus if V is the potential generated by dB/dt around a single turn loop of that size, the potential appearing around this Moibus strip loop should be 2V. The problem with this claim is that the potential appearing around the loop cannot at the same time be V and 2V. Whilst the voltage that appears between the feed line conductors at the T joint might be twice that at the gap, the open circuit voltage induced in the loop due to dB/dt appears at the gap and is simply that for a single turn. The process by which 2V is obtained at the T is an impedance transformation process, no additional power is captured by the loop, no additional power is available from to loop to a conjugate matched load, no power is created in the system. It would appear that it was originally designed in the 1960s for measuring EMP transients from nuclear blasts, hence the desire to suppress Compton transients and discussion of loop time constants. 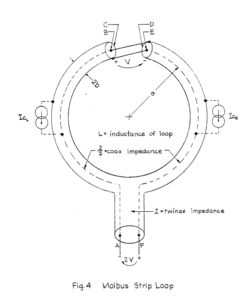 The name “Moibus strip loop” coined by its inventor is not self explanatory, it is not a strip formed into a loop in the style of a Mobius strip, but simply a gapped circular tubular loop with internal transmission lines in each side and that are cross connected at the gap. It offers better common mode rejection of Compton currents that arise in the event of a nearby nuclear bomb, and it incorporates an impedance transformation scheme that transforms the gap voltage to twice that at the feed T joint. Baum, C Dec 1964. 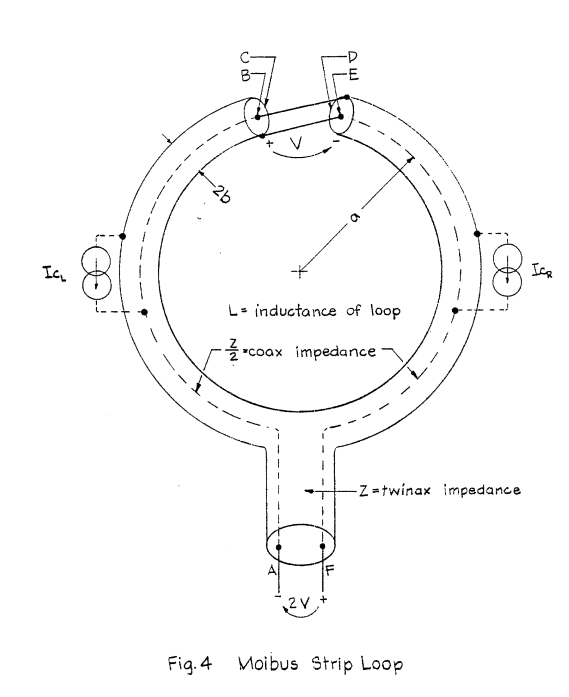 Sensor and simulation notes VIII – characteristics of the Moibus strip loop.